What an adventure 2007 has been! We have seen lots of changes around the Davis household as you can see from our family picture. 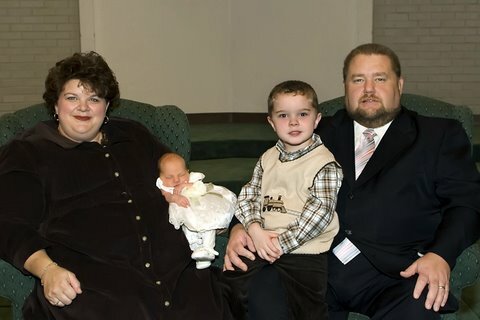 Rebekah Mae Davis joined our family on November 12, 2007. Her delivery was via c-section and mom and baby are doing well. Penny and I had forgotten just how wonderful and exhausting and exciting it is to have a little one around the house. Having another child at this time of the year reminds me that God loves to bring new life into this world – especially the new life found in Jesus Christ. Out of all the things I am thankful for this year, I am most thankful for the people that God has allowed me to help deliver into His kingdom through the new birth. I want to thank our supporters for being on the delivery team! You prayed for and supported us and that has made the difference in every one of these decisions for Christ. Isn’t it exciting to see people put their faith and hope in Jesus Christ? However, it is not enough to be satisfied with history, is it? Too many ministries and churches have stagnated and died because they were satisfied with reaching just enough people. While many new doors are open before us in 2008, there are a few barriers blocking those doors. I would like to ask you to help us overcome those barriers for the sake of the gospel. You will help won’t you? During the month of December, pray for Foundation Ministries for 10 minutes per day on Tuesdays and Thursdays. That will add up to 8 times during the month for 80 minutes. If these days don’t work for you, please pick 8 other days that will. Also, please drop me an e-mail in my personal inbox (rdarrel.davis@gmail.com) to let me know you are doing this. Give a special year-end gift to help us start 2008 with a bang. Any amount will surely be a blessing, but would you give a tax-deductible gift of $250, $500, or $1000. I am praying that God will provide a total of $15,000 or more by Christmas Day to help us meet some special needs. Perhaps you are in a position to provide a matching gift to help us meet this goal? Please contact me as soon as possible if God leads you provide a matching gift. If you are a Harvest Partner with our ministry that gives on a monthly, quarterly or annual basis, would you make a commitment to increase your giving by 25% in 2008? My prayer for you is that you and your family will “know the love of Christ that surpasses knowledge, that you may be filled with all the fullness of God.” May Christmas 2007 be the most wonderful time of the year for you and yours. If you would like to support the work of Foundation Ministries with a tax deductible donation, please click here to go to our ministry website.